The Red Bellied Black Snake loves water, so ponds, creeks and dams are a favourite habitat whilst feeding mainly on frogs, fish and yabbies and occasionally rats and mice. It is not an aggressive species but it’s venom is capable of causing significant morbility, it is not generally fatal and less venomous than the brown snake. Red Bellies are ovoviviparous meaning they give birth to live young and can have up to 25 babies at around 20cm in length and grow to around 2 metres. 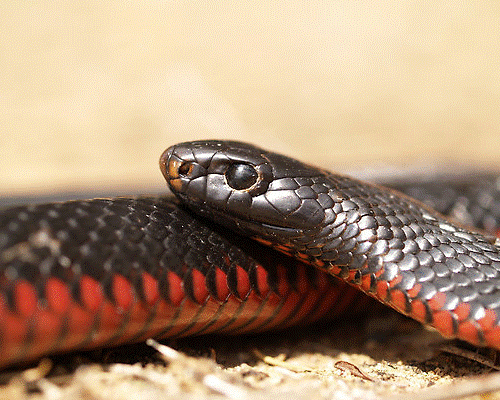 Observations over many years of working with this reptile we have found that the Red Bellied Black Snakes can live in colonies of parents and juveniles growing and living together. There are four species of the black snake; The Red Bellied Black, Collett snake, The King Brown and The Blue Bellied Black snake. Only one of which we see here in Adelaide is the Red Belly. The King Brown doesn’t venture down too much past Crystal Brook which is a few hours north of Adelaide.